The Virden Center is ideal for a group retreat, a reunion or birthday party, a nature field trip, or a meditative getaway. The center is surrounded by nature, the perfect backdrop for a casually elegant wedding. Make use of our complete facilities, with their easy, comfortable layout. Six meeting rooms are fully furnished with technology, including video conferencing, laptop hookups and any Audio Visual rental you may require. Registration and planning services are just the beginning. 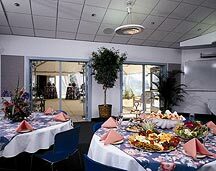 We also offer overnight lodging and catering for all meals. You can dine indoors or outside on the patio. The historic bayside town of Lewes offers a tranquil air and calm waters. Cape Henlopen State Park, with its camping, hiking trails and sandy beaches, is easily accessible. Click here for more information on local attractions.